Juliana lives on the canyon rim writing, raising horses, cooking for friends and family, singing, teaching, and wandering through the wild. She teaches high school including such subjects as English, dual college credit, math, and various remediation topics. She has lived all over the US: Utah, Rhode Island, New York, Florida, Ohio, and now the Panhandle of Texas. She grew up on a family farm in Missouri and once spent a winter living in Veracruz, Mexico. Her travels include India, Nepal, Myanmar, Thailand, Kashmir, England, Dubai, Ethiopia, Costa Rica, and Argentina. One passion is predators, especially pumas. The book, “Sexual Harassment in the Workplace: A Guide to Prevention” ( co-authored with attorney Betsy Doucet) was published in 1992 and has been translated into Spanish. 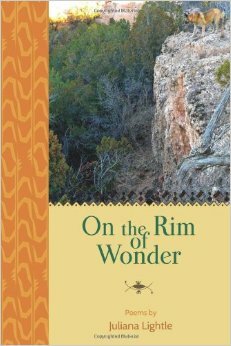 Her new book of poetry, “On the Rim of Wonder” was published April 2014. Both are available on Amazon. Signed copies are available directly from the author. Several of her poems have been published by The Story Circle Network, an organization dedicated to women telling their stories. Their latest anthology, Inside and Out contains her poem, “Babie Doll”. Currently, she is working on two additional books. Hello, there is an exhibition on Lucille Clifton that is on view through December 30 at the Reginald F. Lewis Museum of Maryland African American History & Culture in Baltimore, MD. http://www.africanamericanculture.org. Thank you. I will share this with the group who are taking this class and reading her poetry. Raising horses – coming from a city, I find this interesting and fulfilling. My o my! You raise horses? Wow! Love, love, them! I don’t get the chance to ride them that much around here, but I dream of having one or two of mine someday. I should update this because currently they switched me back to English–seniors no less. A lot easier than teaching freshmen algebra. I’m really glad I stumble on you blog. Warm regards! Since you like to travel, go to my blog and start about last August or so and you can follow my three week trip through Ethiopia–I travelled with friends from there which made a huge different. Will do as soon as I get back from Mexico. I am really looking forward to following this blog. Hi, this is Cornelia, I find your posts and thoughts most interesting. Where can I see more of your trips? If you go to the blog and type in Costa Rica, there are photos, etc. of that. If you type in Ethiopia, there are numerous posts about my trip there and some in Dubai. My book has poems about some of them. All the trip posts have photos of numerous places where I was on these trips.